For the cake I wanted to try my hand at fondant but was way to scared to cover the entire cake so I used THESE awesome cookie cutters as well as another set I borrowed from a friend and cut the characters out of fondant and placed them on the cake. 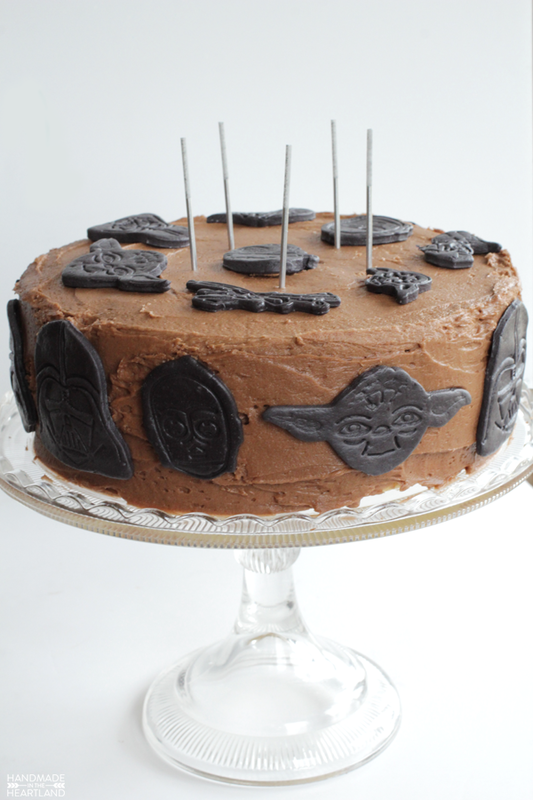 I am in no way expert enough to share making fondant with you yet! 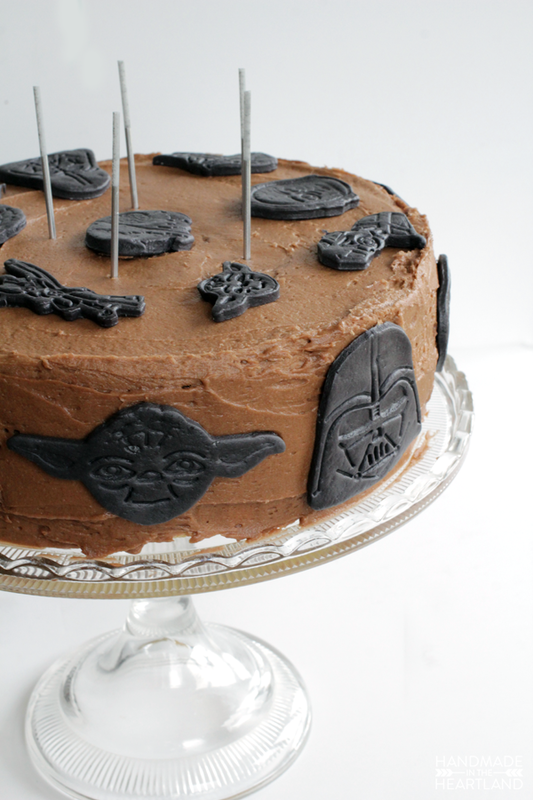 I made the chocolate cake and icing from THIS post. 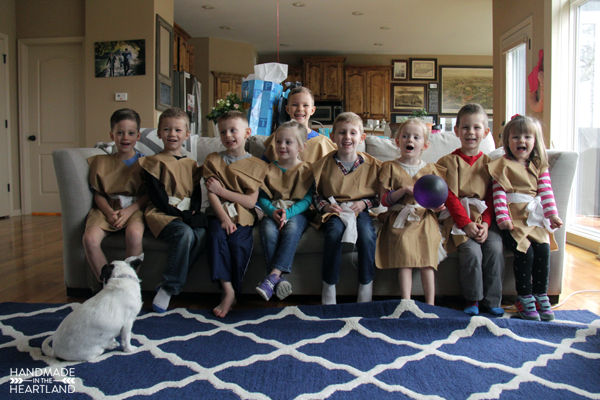 When the kids arrived they all got “jedi robes” to wear which I cut out of plain brown fabric- go to THIS post to get the details. Then there were several different games they played to train to be a Jedi. One of the games was shooting the storm trooper cups down with Nerf Guns . First of all don’t copy me exactly- I was sleep deprived when I was taping those pictures on the cups- they should have been the other way around to stay the cups easier! 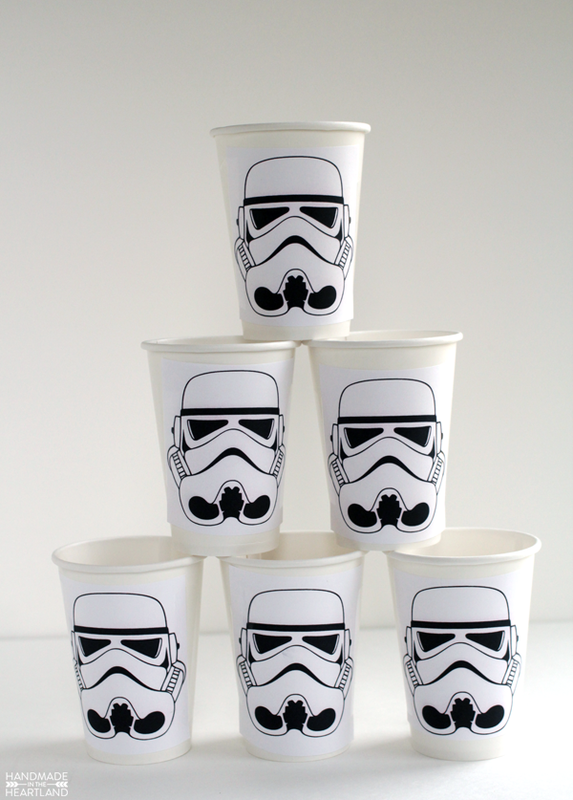 You can download the storm trooper images HERE, I bought the white cups at Walmart in the party section. 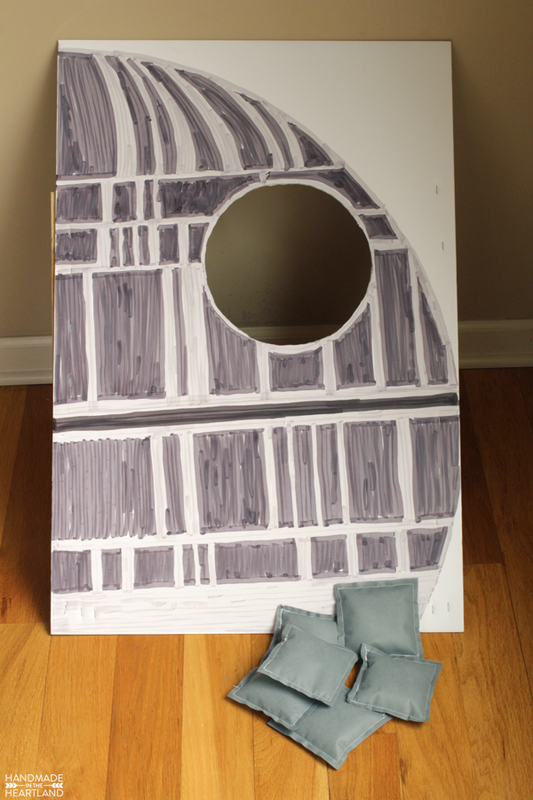 My husband is pretty awesome and drew and made this death star bean bag toss. I mean seriously how awesome is it?! He also drew storm troopers on like 35 balloons that we didn’t take a picture of! ah! I made the bean bags out of Oly-fun, it was a super fast project. 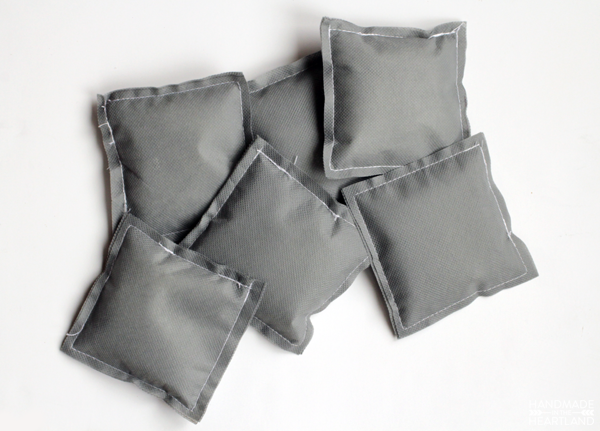 All the instructions for making simple bean bags can be found HERE. 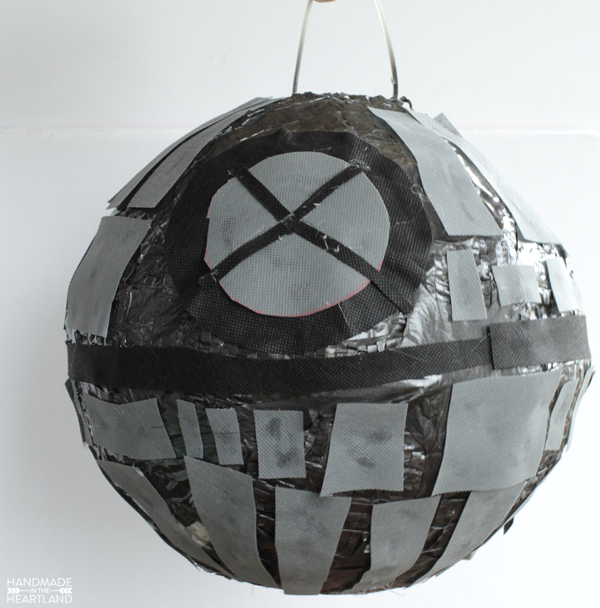 To make our awesome Death Star Pinata we used this Soccer Ball Pinata from Amazon. 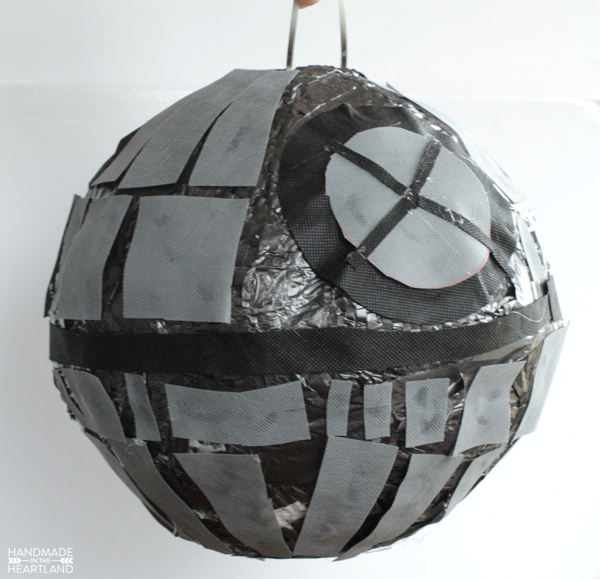 We spray painted it dark gray and then decorated it using Black Oly-Fun and Gray Oly-Fun. 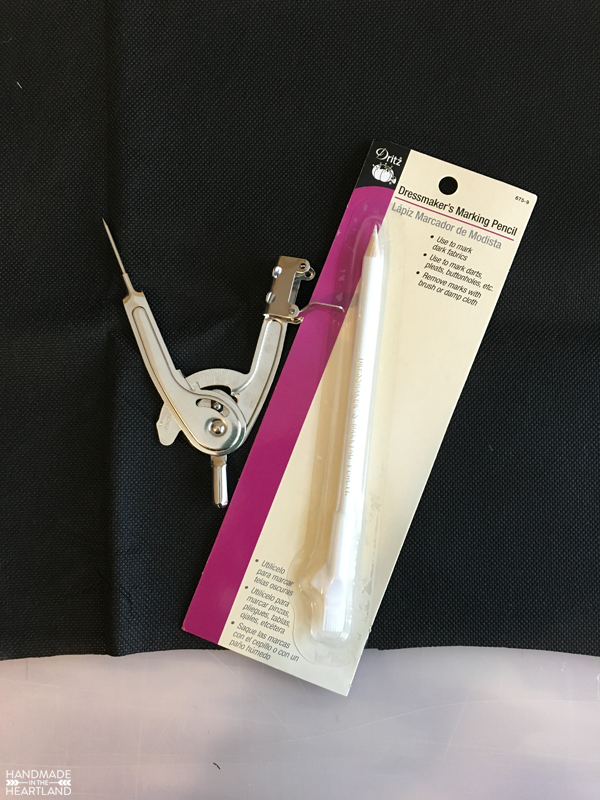 Oly-fun is an awesome all purpose crafting fabric that doesn’t fray and can act like paper or fabric. 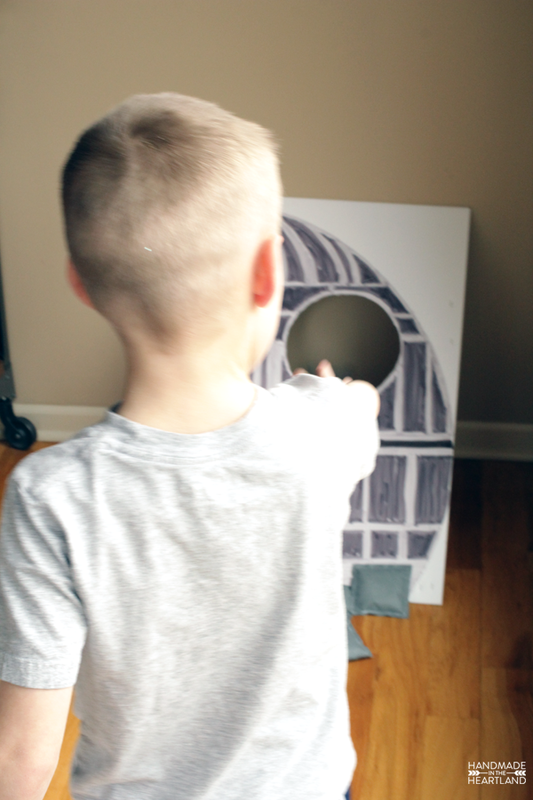 It was perfect for the panels on our Death Star, we just applied it using a hot glue gun. I also used a white dressmaker’s pencil to draw out my shapes on the black Oly-Fun, it totally helps! 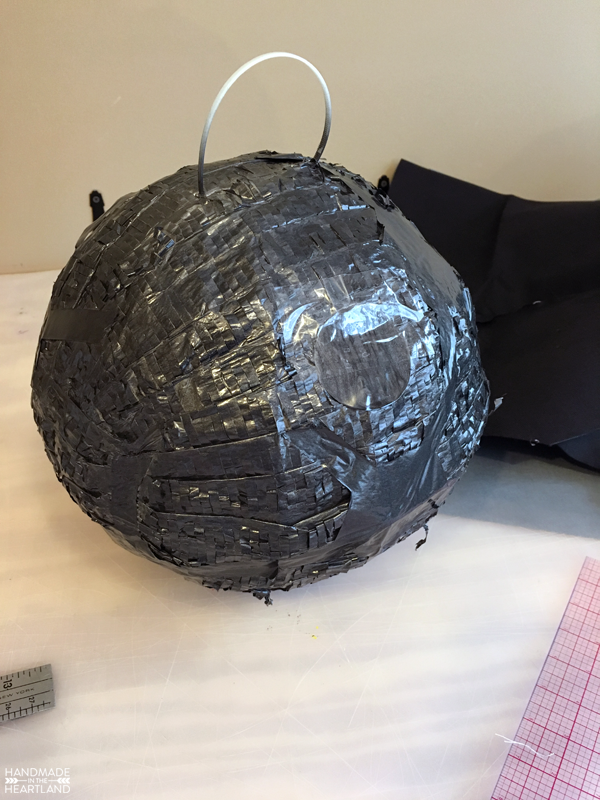 Its hard to try and make a pinata perfect when you know its going to be knocked to shreds just a little while later. 😉 But I think it turned out pretty awesome! Here are all the kids in their Jedi robes, they all had so much fun! 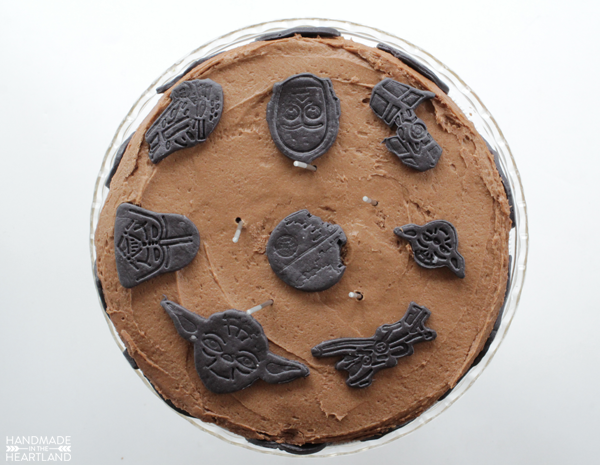 If you have a star wars party please let me know! 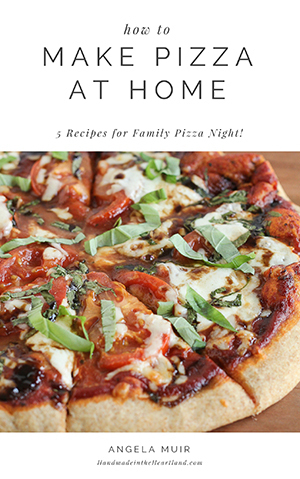 I love to see it when you make things from the blog! Share it with me in the comments or tag me on Instagram (@handmadeintheheartland) or facebook!